The weather has warmed up and at 1 pm when I was leaving there were about 20 people at the springs. 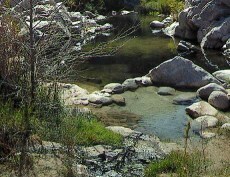 The creek level was above the Serenity Pool and flowing faster than last week. There is a rope and a raft which has been rigged to allow you to pull yourself across. Works very nicely. It does improve safety for crossing but does detract from the scenic quality. I did note the warning signs on trash which someone has sprayed on the rocks. It's just as defacing as graffiti although I agree with the sentiment. The critters are out and there are lots of lizards which means the snakes are not far behind. Beware. Area was fairly clean. There were 3 tents when I arrived at 730 am. Saw several through hikers footprints on the PCT upstream and one of the tents may have been one. Edited 1 time(s). Last edit at 03/19/2010 08:22AM by coyote.